This article is about Coptic Orthodoxy in Canada. For Copts in Canada. 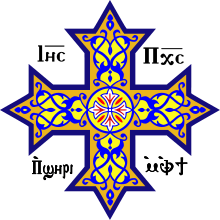 For a list of Coptic parishes in Canada, see the list of Coptic Orthodox Churches in Canada. The immigration of the Copts to Canada (Copts in Canada) might have started as early as the late 1950s. Due to an increasing amount of discrimination towards Copts in Egypt in the 1970s, many decided to emigrate in order to escape the rising racial tensions. Canada has been receiving a greater number of these immigrants, and the number of Coptic immigrants into Canada has been growing ever since. In 1964, St. Mark Coptic Orthodox Church was established in Toronto; this was the first Coptic parish established in the Coptic diaspora. In 2002, a survey showed 22 Coptic Orthodox parishes in Canada, indicating growth. In 2011, there were five Coptic Orthodox churches in Montreal. Apart from the Divine Liturgy, many of the Coptic churches in Canada offer other services to their congregation, such as Choir, Sunday School, Youth Group, Bible Study, Coptic Language Classes, Hymnology classes, etc. These services help to keep the youth as active members of the Church, and serve to maintain an involved Church community. Church websites usually have a list of the services they offer, and on which days they take place. ↑ William Closson James, God's Plenty: Religious Diversity in Kingston (McGill-Queen's University Press, 2011), p. 164. ↑ Census of Population Program Datasets: Religion (2001), Statistics Canada. ↑ 2011 National Household Survey: Data tables: Religion, Statistics Canada. ↑ Saad Michael Saad, "Coptic Civilization in the Diaspora" in Coptic Civilization: Two Thousand Years of Christianity in Egypt (ed. Gawdat Gabra: American University in Cairo Press, 2014), p. 291. ↑ Charles D. Smith, "The Egyptian Copts: Nationalism, Ethnicity, and Definition of Identity for a Religious Minority" in Nationalism and Minority Identities in Islamic Societies (ed. Maya Shatzmiller: McGill-Queen's University Press, 2005), p. 60. ↑ Coptic churches in Canada on alert, CBC News (January 4, 2011).